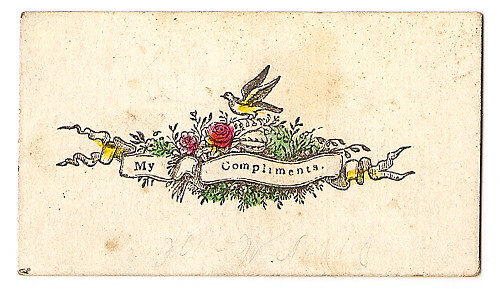 Business Card – Flower Bird “My Compliments”, originally uploaded by ink_ling. We sat and went through all the places I have lived for the last ten years. On average, my father and I have lived in a single residence for a year. Meaning once every 11 months we pack up everything we own, move, and unpack again. Needless to say, moving is a science to me and I use it as a platform for my spring cleaning. That being said, I have seen many things come and go, but not once have either of us (my father and I) questioned why we pack boxes, trunks and dresser drawers full of hundreds of books and haul them across town again and again like clockwork. Never have we paused to say “I have never read this” or such silly things like “this is very outdated” or question why we have several volumes of haphazard Shakespeare compilations. In the eyes of foreigners (those not accustomed to our ways) this might seem absurd. They might see the eighteen bibles and the six F. Scott Fitzgerald novels and three copies of The Taming of the Shrew and not understand our ways of being. Perhaps these novels will never be touched. Perhaps they will be passed down or well loved or damanged in a flood. Their fate matters not. What really matters here, friends, is that of all the furniture, clothes, hobbies, and knick-knacks to pass through our Gypsy Lives, the books have remained. Most of them are dusty, worn, HEAVY and generally not easy on the eyes, but they’re almost a currency… a measure of value. Yes, our couch is hideous, but we have every classic novel you can dream of. No, the carpet doesn’t always get vacuumed, but my dictionary is well-thumbed. See? pencil marks in the margins. Scraps of colored paper mark long-forgotten crusades and note cards call out to mysterious root words. Ignore the family photos, these are the real treasures. Come one, come all! My family history is in these books, somewhere. Can you not taste it in the air? I do. With every glance at the embossed titles, every snap of a turned page, I am reminded of my past, my future. Like these books, life may not look too neat to start with. I may come out of this dirty, worse for wear, maybe even dog-eared, but boy will I have a story to tell. Ah, yes, indeed you have many stories to tell and you will tell them well! I am so glad to read a new post from you. Keep writing, Novel Dame.